My colleagues have been hard at work for over two months designing a new and improved dashboard for all Transloadit users to enjoy! With a more modern look, streamlined interfaces and brand-new features being some of our main goals, we're seeking any and all feedback from our users. Let's dive into the changes and see all the improvements that have already been made. Do note that nothing I am showing you today is final, as we are still making a lot of tweaks and changes. Across the board, we are planning to roll out a completely new design for all of our UI that is behind the login. We want our customers to have an easier time navigating Transloadit. The less time you have to spend figuring out where to go, the more time you get to spend actually using the features we offer. With that said, let's take a look at the new Overview page! At a quick glance we can already see improvements in terms of design. 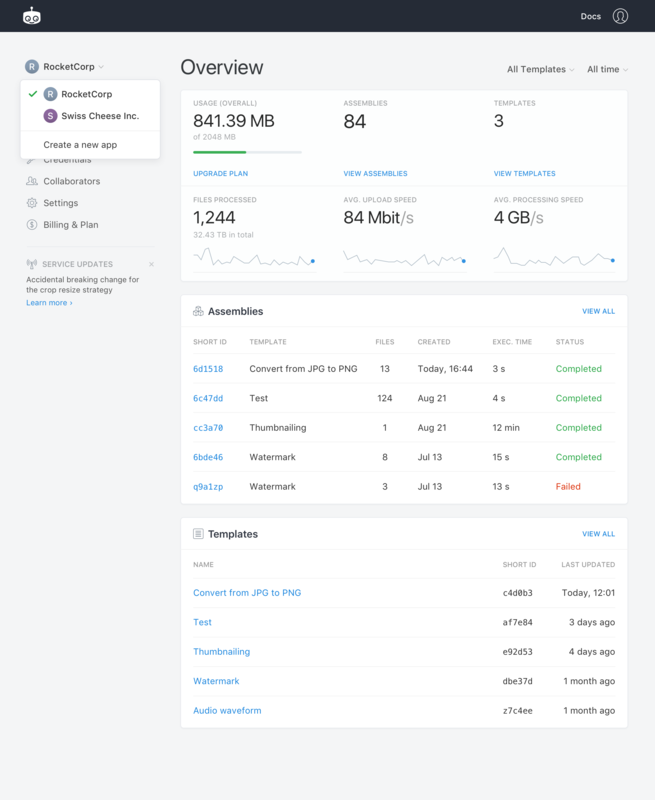 Now you can see your Assemblies and Templates in one place, and in addition to this, we are now displaying some useful statistics at the top of the page. 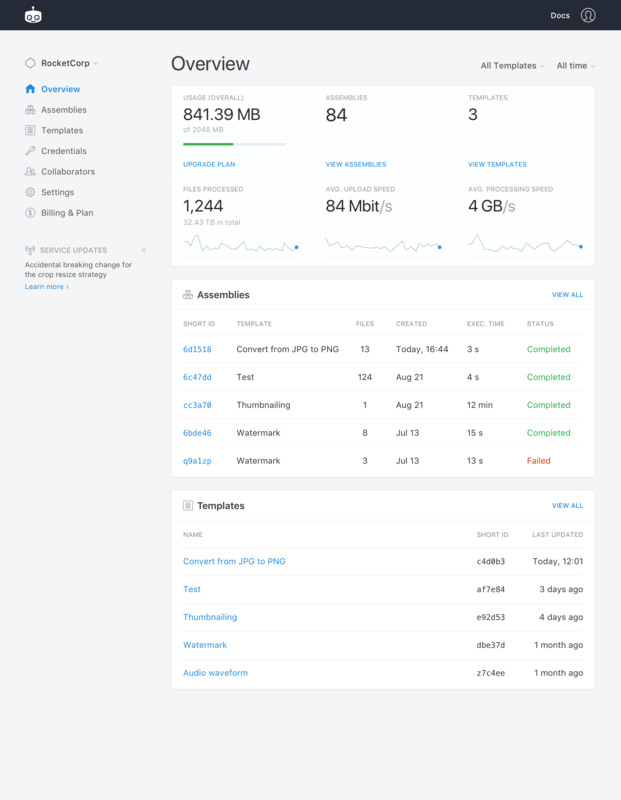 You can directly monitor your overall usage, the number of Assemblies and Templates, the total number of files processed and even keep an eye on uploading and processing speeds in real-time. We know that many of Transloadit's users are a part of large, hard-working teams. With our new Collaborators feature, we want to make your team synergy even more effective. Our plan is to let customers share their access to Assemblies and billing information without the need to share emails or passwords. A much safer and user friendly solution. Let's look at an example Collaborator page below. Through this interface, Owners can simply add any email address and send an invitation link to their teammates. These Collaborators can then be given one of our predefined roles in order to determine how much access they need (Billing, Developer, Admin). 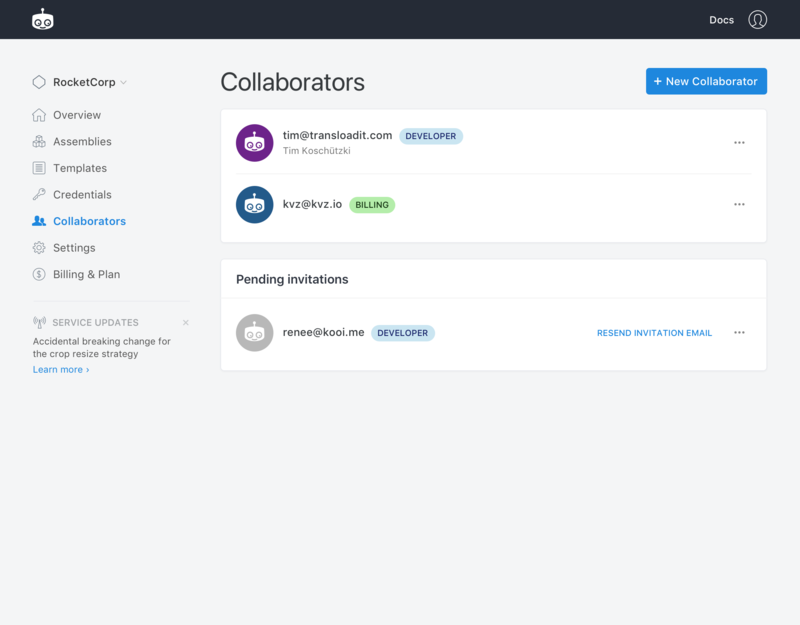 The Collaborator feature isn't the only new piece of functionality we are adding to help you speed up development. You might also want to check out our new Application feature, which will make organizing your Assemblies and Templates easier than ever! Creating an Application lets you group all of your Assemblies, Templates, and Credentials together in one overview. Rather than having a list of unrelated – or unneccessary – Assemblies, you can create an Application that stores only the Assemblies you choose. For example, users that utilize Transloadit to work with multiple business clients could opt to separate their Assemblies by client. Others may want to separate development, staging and production accounts, but control them without logging out and in again. Our Template creation page is also undergoing some exciting modifications. 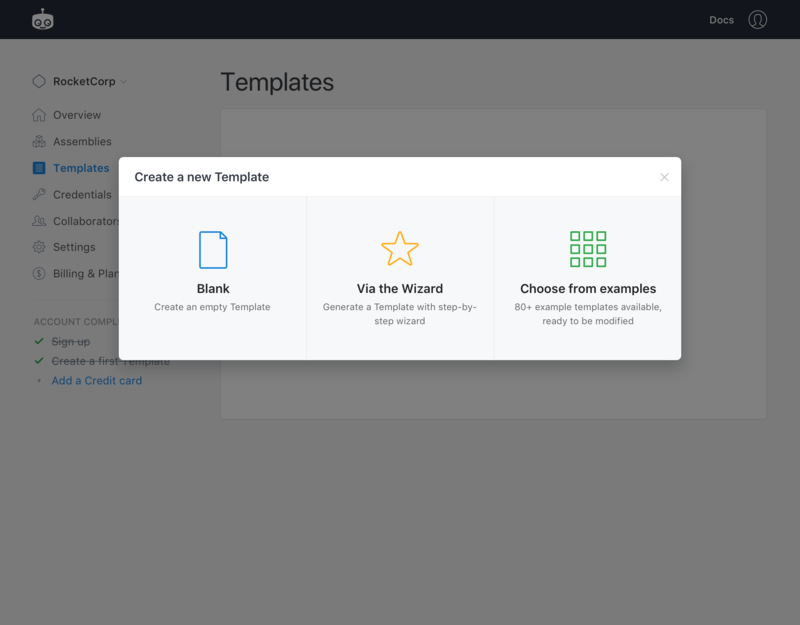 We're working on adding more options to the Template creation process. Currently, every new Template gives you one of our basic Assembly examples. We've decided to change that and let our users choose the option that works best for them. If you just want to get started with blank Assembly Instructions and let your creativity flow – feel free! Maybe you want to search from the vast number of examples we offer. Or maybe you're new to Transloadit and want to try out our Wizard to create a Template by following five simple steps. Overall, we're constantly striving to offer our users the smoothest experience possible, and what you have seen here today is only the tip of the iceberg. We have a lot more exciting improvements in store for you, but you'll be hearing about those when the time comes!